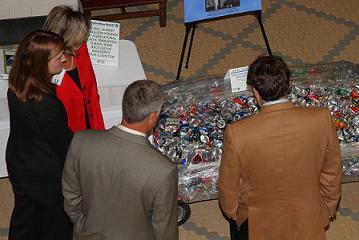 MRC members (left two) assist two State Legislators in determining the number of aluminum cans contained in a bale provided by the City of Oxford's Recycling Center. JACKSON – The Mississippi Recycling Coalition and the Southeast Recycling Development Council recently hosted their inaugural “Mississippi Recycling Awareness Day” at the Capitol in a networking breakfast event with State Legislators. This event was designed to inform legislators and other state elected officials of the recycling industry’s steady contributions to the state’s economy as well as the benefits of energy and natural resource conservation. Over 150 people attended the networking breakfast, including legislators, legislative staff, industry representatives, local and state government officials and other state, local and federal organizations. This networking opportunity allowed for open dialogue about the impact that recycling has on creating jobs and generating significant personal income and state revenue. Through the event’s networking opportunities, recycling industry representatives were able to provide information to legislators on the numerous Mississippi companies that help recover recyclables from the waste stream and the companies that rely on recycled feedstock. The number of businesses that depend on recycling in the state underscores the need for increasing support for recycling and preventing manufacturing feedstock from being disposed. The Coalition’s efforts drew support from Governor Phil Bryant who remarked that the recycling industry has great potential in the state’s future economic growth. “We must position our state to boost recycling efforts and take advantage of the growing economic development opportunities that this important industry offers,” Gov. Bryant said. In addition to the Governor’s support, the Mississippi House of Representatives adopted a resolution proclaiming that day, April 11, to be “Mississippi Recycler’s Day” and recognizing the positive impacts that the recycling industry has on Mississippi’s economy and environment.